If you have some sort of skin discoloration, you’re not alone. In fact, facial brown spots and discoloration are the top reasons for cosmetic visits to dermatologists. Laser treatments represent a breakthrough in age-defying skin care that treats skin non-invasively. To discuss treatment or book an appointment for a free consultation contact us on 01244 630503 or book an appointment on-line below. Click on the drop down tabs below for further information. Age Spots or “Liver” Spots: Smaller darkened patches usually on older adults who have been exposed to the sun for many years. These spots can be seen on the face, forearms and back of hands. Post-inflammatory Hyper-Pigmentation: This type of hyper-pigmentation results from any inflammatory injury or trauma to the skin. For example, acne often leaves dark discolouration after a blemish heals. Rashes like psoriasis and eczema often darken the skin as well. Pigmented lesions can vary in size. Shape and depth. Some are no bigger than a fingertip or even a pinhead, while others may be as large as a hand and occur in conspicuous places such as the face, neck or arms. They can be either raised or flat and are usually a cosmetic rather than a medical concern. However, all pigmented lesions need to be looked at prior to treatment to confirm. During your consultation we will determine if your pigmented lesions are safe to treat. 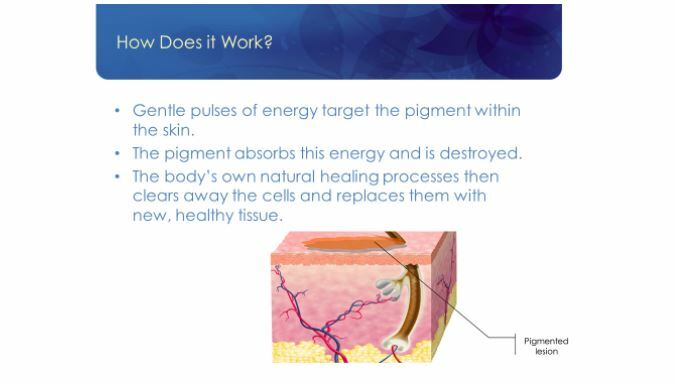 What is laser treatment for pigment? Laser treatments use short, safe bursts of light to target and treat specific skin conditions. Today’s lasers are very sophisticated and carefully deliver the appropriate amount of energy for your specific skin. Effectively treats unwanted pigment to improve sun-damaged skin. Targets excessive pigmented cells to remove the unwanted age/sun spots leaving skin looking younger, clearer and smoother. The Cynosure Elite+ laser delivers a precise amount of energy to effectively treat unwanted pigment. The laser handpiece is placed over the skin where the brown spot or other pigmentation sits and a bright flash of light is released. This light is absorbed by the pigment and sunspots and converted to heat. The heat damages the cells that created the pigment and cause your body to naturally dispose of this tissue while creating new, healthy tissue. Here at The Laser Me Clinic, we use the most advanced system available – the Cynosure Elite+. The Elite+ is best-in-class and lets us give you the results you want. 2 in 1. The Elite+ is two lasers in one system- Alexandrite and Nd-Yag lasers. Each laser is better at targeting different unwanted conditions, giving you the best results possible. Thousands of treatments have been performed with the Elite+ laser and it has been proven safe and effective on patients of ALL SKIN TYPES. Treatments are very well tolerated. Many clients describe the treatment as a “warm sensation” or the snap of an rubber band. The procedure typically takes less than 20 minutes to perform depending on the size of the area or number of pigmented lesions being treated. Often you will see great results after the first treatment session but 2 3 sessions may be required for optimal outcomes. You will need to avoid the sun, tanning beds and self-tanning creams and lotions prior to treatment. There may be some medications that you will need to avoid and your therapist will cover these during your free consultation. Some patients experience a mild sunburn sensation for a short time after the procedure. We may apply an ice pack immediately following your treatment to help minimize this. The pigmented lesions will darken over the next few days. The area will look a bit “dirty” or dark for about a week. Over this time, the treated skin will slough off, revealing fresh new skin. Typically, you can resume regular daily activities immediately following treatment. Makeup can be applied to the treated area immediately, if necessary. Laser pigment clearance can be performed on the face and chest, as well as on the hands, arms and legs. This often depends on the pigmented lesion you have. For some brown spots, only a single treatment is needed, for others, a series of treatments may be recommended. Often you will see improvements within a couple of weeks, with further improvements on subsequent treatments until you have achieved the over-all improvement you desire.